Rosewill delivers the Armor Evolution, a new mid-tower steel case with support for motherboards as large as EATX. Priced around $120, this case offers room for three 5.25" devices (one convertible to 3.5"), seven 3.5" drive bays and seven expansion slots. The interior seems to feature largely tool-free installation, as well as the usual cut-outs for cable management, holes for watercooling tubes, a cut-out for easy CPU cooler swapping, and dust filters. Cooling is provided by two 120mm red LED front fans (with LED on/off switch), a 120mm rear fan, a 230mm side fan and a 120mm top fan. On top of that, the case also has room for two 120/140mm front fans on the HDD rack, an additional 120/140mm fan in the top, a 120/140mm bottom fan, and up to four 120mm fans in the side if you remove the 230mm fan. The Armor Evolution supports graphics cards with a length of up to 369mm and CPU coolers with a height of up to 165mm. A top I/O panel provides two USB 3.0 ports, two USB 2.0 ports, and HD audio. Rosewill®, the leading brand of PC Components and Peripherals and award-winning power supplies, computer cases, and gaming peripherals, is introducing the Armor Evolution, a Mid-tower with support for E-ATX motherboards. 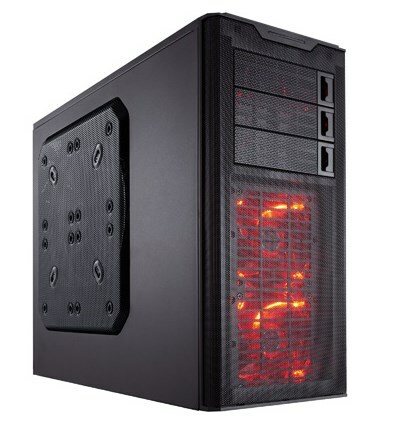 The Armor Evolution is the next generation of Rosewill’s Top Selling mid-tower case, Armor. Designed to maximize internal capacity for the ever evolving dimensions of today’s and tomorrow’s PC components and support for 2 Front USB 3.0 ports. The Armor Evolution is an Extreme Mid-tower case, ideal for Enthusiast PC builders and gamers for its large internal capacity with support for powerful VGA cards, performance CPU Coolers, and performance case cooling. Armor Evolution is also ideal for non-gamers alike because of its sleek appeal, competitive pricing, and tool-less design for quick and easy installation. Armor Evolution provides performance cooling out of the box. Pre-installed are Dual Front 120mm Fans with Red LEDs, 1 Top 120mm Fan, 1 Rear 120mm Fan, and a large but quiet 230mm Side Panel Fan to ensure your components stay cool at all times. The perforated Front Panel compliments the cooling by allowing the fans to draw in cool air efficiently. If the pre-installed fans aren’t enough, there are optional slots to install 2 additional Front 120mm Fans behind the HDD Rack, 1 Bottom 120mm Fan, and an additional 1 Top 120mm fan. The large 230mm side panel fan can be removed to support 4 120mm in its place. 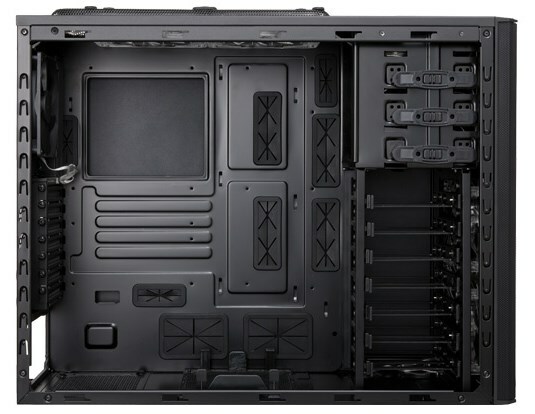 Armor Evolution provides support for Micro ATX, ATX and E-ATX motherboards in a Mid-Tower chassis. Expansion is provided for up to 7 3.5” devices, up to 3 5.25” devices, and expansion slots for up to 7 add-on cards. Tool-less design allows for the quick and easy installation of 3.5” and 5.25” devices. VGAs are supported up to 14 inches and CPU Coolers have a clearance of 6.5 inches allowing many options to choose from when deciding to build your own PC computer. Armor Evolution provides a CPU cutout to support large CPU Coolers, 3 cutouts to support liquid cooling cable routing, and 8 strategically placed cutouts for all cables to allow for a clean and organized build. An externally accessible removable slide-out dust filter provides easy cleaning and additional protection of your components from dust build-up. Included is a button to turn on/off the lights of the Dual Front Fans with Red LEDs for a stealthy appeal. The Armor Evolution is re-defining a Mid-Tower case with support for E-ATX motherboards and 2 Front USB 3.0, competitive pricing, large internal capacity, and a sleek design.